Looking to upgrade your Discord experience to its peak performance and support us at the same time? 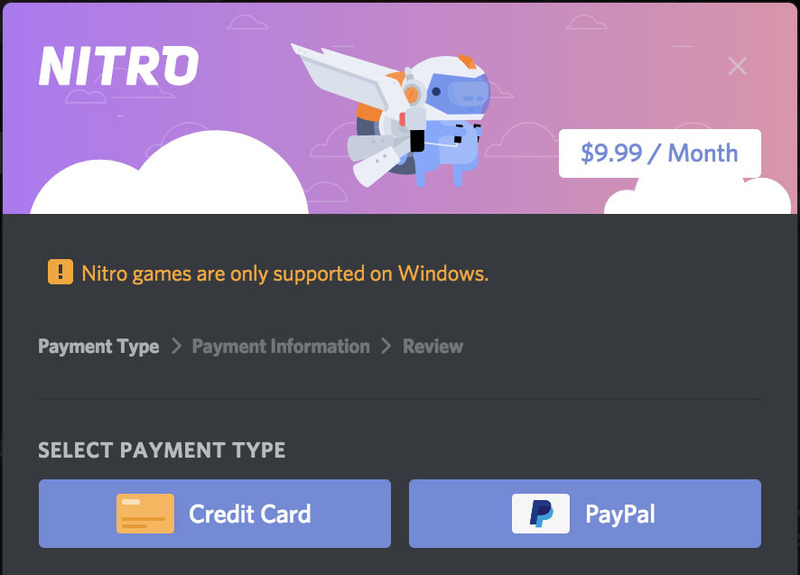 You can now with Discord Nitro & Discord Nitro Classic! It's worth noting that Discord's core features will stay free! Group calls, making as many servers as you like, and all the fun stuff in between will never cost a dime. Nitro is all grown up now and is ready to pass the torch to its little brother Nitro Classic. Upload a Gif Avatar: Nitro Classic will let you add some animation-y goodness to your profile picture. You can turn your still life avatar into a cool moving GIF, and it'll show up and do its magic tricks in text channels and all of your friend's servers. 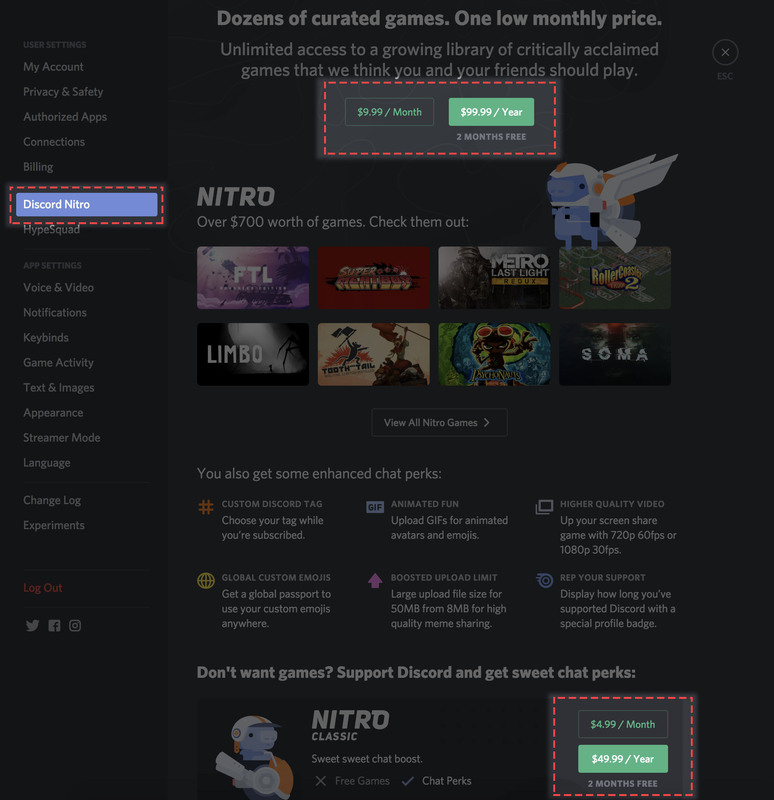 Choose Your Discord Tag: Customize your four digit Discrim when subscribed to Nitro Classic! Note, at the end of the subscription, your Discrim will randomize. Use custom emotes everywhere: While normally, custom emotes can only be used in the server that they've been uploaded to (with a few exceptions), Nitro will unlock your Kappa arsenal to be unleashed in every server and DM at your every whim. Remember, with great power comes great responsibility! Higher Quality Screen Share: Up your screen share game by being able to screen share games with 720p @ 60fps or 1080p @ 30fps. Increase your file uploading cap from 8mb to 50mb: Normally, you can upload individual files up to 8mb at a time, but having Nitro will supercharge your upload cannon into a 50mb force to be reckoned with. Bonus: You'll also get this sweet Nitro badge to show off to your buddies in your profile. Cool kid status. Nitro is peak Discord support. With Nitro, you’ll get all of the awesome chat perks that are included in Nitro Classic AND Nitro will offer games for you to play when subscribed! Your Nitro subscription is all you’ll need in order to enjoy these awesome titles. To check out what games are offered with Nitro, navigate to the Store > Nitro Games> View All Nitro Games. To learn more about downloading & playing games be sure to give this guide here a gander. It’s our intention is to have these games available for Nitro subscribers as long as possible; however, how long a game is available is dependent on game developers/publishers. You will still have access to your saves, even if a game is removed from the subscription library. We want to add the best titles to this library as frequently as possible. Note: If you currently have an ongoing subscription from before Wednesday, October 10th, 7:20:00 PM PDT, check out this article here about some extra boosted perks to thank you for all the ongoing support! Signing up for Nitro & Nitro Classic is pretty simple as well. Go to your User Settings page and locate the Discord Nitro tab. Note: When signing up for the yearly plans, the "two months free" is in reference to paying $49.99/$99.99 for Nitro Classic/Nitro compared to spending $59.88/$119.88 @ the regular $4.99/$9.99 monthly rate. The yearly plans do not offer a free two month trial. This will open a new screen, allowing you to enter your payment info. On the next screen, enter your credit card information and other payment detail. Upon successful completion of the payment, Wumpus & Co. will reach the destination, win the prize, and you'll be Nitro-charged and good to go. Paying from a linked bank account works! Learn more about billing here! We've made Nitro a subscription-based feature. What this means is that when you sign up, you'll have two options to sign up: pay $4.99/$9.99 USD per month or $49.99/$99.99 per year (whoa, it's like getting two months free, like we talked about earlier!?) to keep your account all Nitro'd up. Put simply, when you pay the subscription fee, you'll get a month-long Nitro boost to your account. No more payment on your end, and you'll enjoy those features for 30 days. You can cancel your Nitro subscription at any time by pressing the Cancel button in your Nitro Payment information screen. With a canceled subscription you’ll be able to re-subscribe, along with check when your current subscription ends, in the same area. Due to all of the support for Nitro from all of you fantastically amazing people, we’re excited to have a new boost added to Nitro! THANK YOU ALL! We'd consume you in hugs if we could. 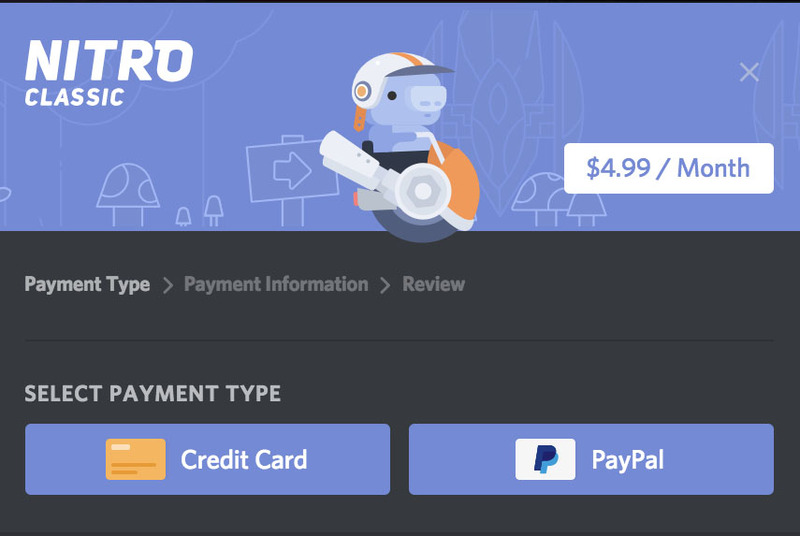 Finally, if you run into any troubles with improper charges or further questions about payment information, please email us at support@discordapp.com, and we'll help you there.